124 species were recorded this year – a highly respectable total. As has been the case over the last few years, the site was visited by birders almost every day. Although another year passed without a Green Sandpiper, 2011 was nevertheless a good one for waders. Flyover Turtle Doves were recorded again after a three-year gap. During spring and autumn a total of 401 hours ‘skywatching’ hours were spent at the Cascade, an increase of 74% on the previous year. Not surprisingly the numbers of migrating raptors observed increased accordingly – 221 individuals were noted which represents an increase of 69% on 2010. A summary of the raptor migration may be found at the end of this report (Appendix I and II). Three species were recorded for the first time : Great Egret, Night Heron and Bar-headed Goose, all of which were observed flying over the park. Small numbers observed occasionally in winter. Larger numbers noted in spring (between 27th February – end of April) with a maximum of 179 on 2nd April. Almost absent after 28th April. Autumn passage noted for the first time on 14th September (4 birds) [DT]. Observed regularly in autumn until mid-November with a maximum of 202 on 7th October [PR]. Single birds noted irregularly throughout the year either at the Mare Perchee or perched in trees nearby. At least two different individuals noted at the beginning of April, although these were never observed together. Almost absent in winter (January-February and December). Noted for the first time fishing on site on the 19th March [DT]. Small ‘migrating’ flocks sometimes noted during skywatches : 5 on 18th August, 10 on 1st September and 10 on 15th September [DT]. 7, 29th October [SC/DT] - 3, 31st October [PR]. Still a rarity in the region these constitute the first records for the park. Both observations were of flocks of migrating birds flying southwards. Photo: Great Egret; D.Thorns, 29th October 2011. One record in late spring. This constitutes the first record for Beaumonts. It was of an individual flying purposefully towards the north, high in the sky, in the middle of the afternoon. Observed migrating over the park on 7 dates (1 in spring and 6 in autumn). 4, 20th August [PM/PR/DT] - 10, 21st August [PR/DT] - 10, 3rd September [LS/DT] - 14, 5th September [LS] - 1, 16th October [PR/DT] - 1, 29th October [SC/DT]. 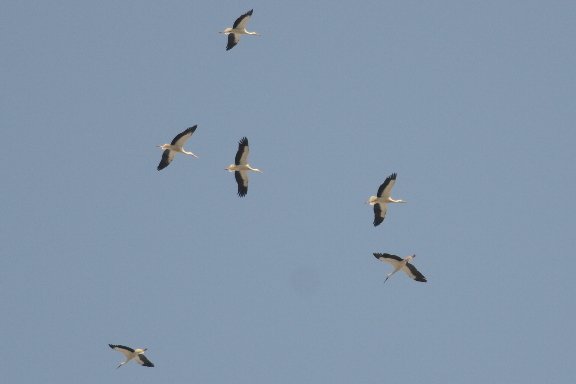 Photo: White Stork; D.Thorns, 21st August 2011. Observed migrating over the park on 2 dates in early autumn. 1, 27th August [SC/DT] - 1, 3rd September [DT]. 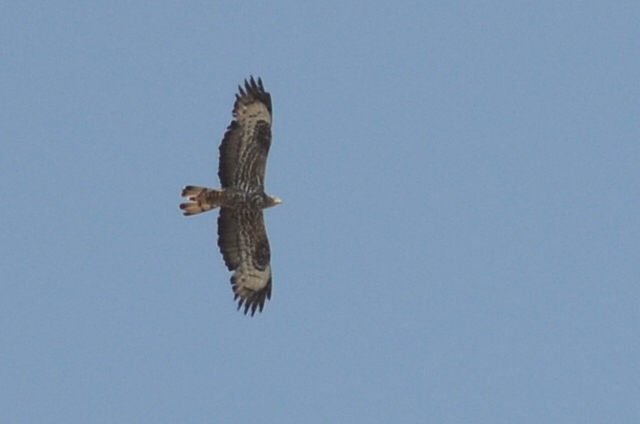 Observed flying overhead on 2 occasions (in spring and in autumn). 97, 6th February [PR/DT] - 14, 27th February [PR/DT]. 69, 5th November [PR/DT] - 74, 5th December [PR] - 6, 10th December [PR] - 79+, 18th December [DT]. Observed flying over the park on 6 occasions. Although this species has never been observed landing on site this nearly happened early in the morning on March 9th when a pair circled very low around the Mare Perchee. 1, 7th March [DT] - 2, 9th March [DT] - 2, 23rd March [QD] - 2, 26th May [DT] - 13, 7th September [DT] - 5, 16th September [PR]. 1 observation in autumn – a first for Beaumonts. The bird was seen early in the morning flying over the park in amongst a flock of Canada Geese. Small numbers observed irregularly throughout the year. A pair nested at the Mare Perchée for the third consecutive year. As in previous years noted for the first time on site at the beginning of February (a pair also roosting overnight at this time). Later in the month a wandering group of 4 birds often observed visiting the Mare Perchee, and just as often chased away from the area by the resident pair. Up to 5 males observed almost daily in spring up until mid-April. Breeding confirmed with the appearance of 12 ducklings on 18th April (3 weeks earlier than in 2010). Half were lost during the following 48 hours, and only 4 ducklings were left by 29th April (11 days later). These remaining birds were observed daily thereafter until the beginning of June. Rarely observed during the second half of the year - small numbers (normally 4 – the juveniles ?) noted occasionally in flight. Recorded on 5 dates (as was the case last year) : 1 in spring and 4 in autumn. 1, 28th August [SC/CF/DT] - 1, 11th September [PR/DT] - 1, 15th September [PR] - 1, 20th October [PR]. See Appendix I and II. 1, 7th October [PR] - 1, 15th October [SC/DT] - 1, 16th October [PR/DT]. Observations at Beaumonts continue to increase. Noted flying over the park on 8 dates (twice as many as in 2010) : 7 in spring and 1 in autumn. 1, April 16th [DT] , 3, 18th April [PR/DT] - 2, 1st May [DT] - 2, 6th May [PR] - 3, 8th May [PR/DT] - 1, 21st May [CF/DT] - 1, 29th May [PR/LS/DT]. Another good year – observed migrating over the park on 28 dates (9 in spring and 19 in autumn). At least 46 birds were involved. 1, 24th March [DT] - 4, 27th March [SC/DT] - 5, 2nd April [PR/DT] - 2, 13th April [PR] - 2, 17th April [SC/PR/DT] - 1, 27th April [DT] - 2, 30th April [QD/PR/DT] - 1, 1st May [DT] - 1, 28th May [SC/PR/DT]. 1, 31st August [DT] - 3, 2nd September [DT] - 3, 3rd September [RC/DT] - 1, 7th September [PR] - 1, 13th September [DT] - 1, 16th September [PR] - 2, 17th September [DT] - 2, 20th September [PR] - 2, 25th September [PR/DT] - 1, 29th September [PR] - 1, 1st October [PR/DT] - 2, 7th October [PR] - 1, 8th October [QD/PR/DT] - 1, 13th October [PR] - 1, 16th October [PR/DT] - 1, 17th October [PR] - 1, 20th October [PR] - 1, 14th November [PR] - 1, 19th November [PR]. Recorded on 6 dates (3 in spring and 3 in autumn). 1, 24th March [DT] - 1, 24th April [PR/DT] - 2, 1st May [SC/QD/FP/LS/DT]. 1, 11th September [PR] - 1, 13th October [PR] - 1, 23rd October [PR]. A very good year in comparison with 2010 – more than double the number of birds recorded. Observed for the first time ‘’on site’’ (even perched) in winter – 1 individual was noted on three consecutive days in January. At least 69 birds were involved. 2, 3rd January - 1, 7th January - 2, 9th January - 1, 21-23 January - 1, 29th January - 1, 30th January - 1, 6th March - 2, 20th March - 1, 27th March - 3, 2nd April - 3, 10th April - 1, 16th April - 1, 18th April - 2, 23rd April - 3, 24th April - 1, 30th April - 2, 1st May - 1, 21st May. 1, 28th August - 2, 2nd September - 4, 3rd September - 4, 24th September - 2, 25th September - 1, 1st October - 1, 2nd October - 1, 14th October - 7, 15th October - 4, 16th October - 1, 17th October - 3, 20th October - 1, 22nd October - 3, 23rd October - 3, 13th November - 2, 19th November. Rather a good year – many more birds recorded than in 2010. Observed on 23 dates (8 in spring, 1 in summer and 14 in autumn). At least 53 birds were involved. 1, 1st May [SC/QD/FP/LS/DT] - 1, 15th May [PD/DT] - 1, 22nd May [PR/DT] - 2, 28th May [SC/PR/DT] - 1, 29th May [PR/LS/DT] - 3, 4th June [QD/PR/DT] - 4, 5th June [SC/PR/DT] - 1, 25th May [DT]. 1, 20th August [PM/PR/DT] - 1, 24th August [DT] - 6, 27th August [SC/DT] - 14, 28th August [SC/CF/DT] - 1, 2nd September [DT] - 2, 3rd September [RC/LS/DT] - 1, 5th September [LS] - 1, 6th September [PR/LS] - 1, 7th September [PR] - 1, 10th September [SC/DT] - 1, 16th September [PR] - 2, 18th September [QD/PR/DT] - 2, 20th September [PR] - 2, 24th September [LS/DT]. Unidentified larger raptors were noted on 11 dates. 24 birds were involved (17 in spring and 7 in autumn). See Appendix I et II. Observed regularly (normally 1-3 birds) throughout the year. Breeding confirmed for the fifth consecutive year in woodland near the Parc Mabille, the begging calls of juveniles being heard at the end of July and in early August (as was the case in 2007-2010). 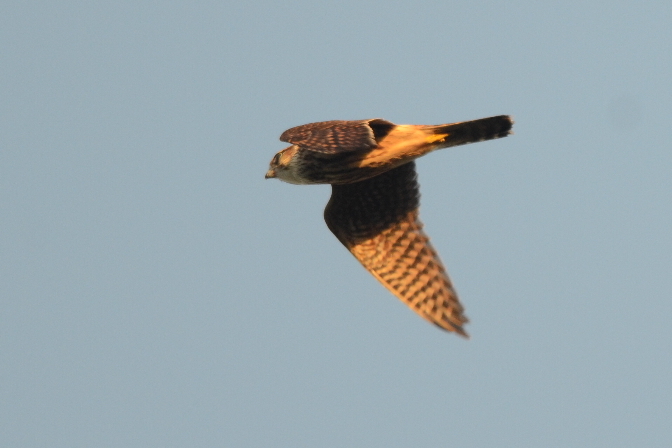 The juveniles were seen for the first time on 20th July, flying around the Bois de Bordure [DT]. 1-4 birds noted occasionally in active migration (observed on at least 6 occasions in autumn between 18th September – 5 November). Breeding in the vicinity, 1-3 birds (usually 1) observed almost daily throughout the year. Although the bulk of observations involved ‘local’ birds, the species was noted on several occasions in active migration (for example : 1 on 9th March [LS/DT] and 1 on 13th October [PR]). 1-3 birds recorded in spring, summer and autumn. Recorded far more frequently during the summer than in the last two years (noted quite often from the end of May to the end of August). At least 3 birds observed hunting high over the park on 28th August [QD/SC/DT]. Observed for the first time in spring on 17th April [SC/PR/DT] - last observation in autumn on 13th October [PR]. With a breeding pair at the nearby Porte d’Ivry (94) this species has become far less of a rarity. 1-2 birds recorded on 15 dates spread sporadically throughout the year. 1, 2nd January [PR] - 1, 10th March [PR] - 1, 10th April [SC/DT] - 1, 17th April [SC/PR/DT] - 1, 22nd April [DT] - 1, 29th May [PR/DT] - 1, 7th August [DT] - 2, 3rd September [DT] - 1, 24th September [LS] - 1, 13th October [PR] - 1, 16th October [PR/DT] - 1, 20th October [PR] - 1, 20th November [PR] - 1, 2nd December [PR] - 1, 10th December [SC/PR/DT]. Observed migrating over the park on 2 dates in autumn. Recorded on 4 dates (2 in spring and 2 in autumn). 8, 26th February [DT] - 1, 10th April [SC/DT]. Resident – 1-8 birds observed daily throughout the year. Breeding confirmed at the Mare Perchée and at the Mare de Brie, a pair at each location producing two broods. Copulation observed at the Mare Perchée during the early morning on 6th April [DT]. A chick was observed for the first time there on the 10th May, and at the Mare de Brie on 27th May [DT]. At the end of July a minimum of 2 chicks and 2 juveniles present at the Mare de Brie, and 2 chicks and 3 juveniles at the Mare Perchée [DT]. Unfortunately a healthy (and increasing) population of rats has recently developed at the Mare Perchée and is surely responsible for the loss of many offspring. Observed flying high over the park in small groups. Not a particularly good year – just 1 observation in autumn. Observed flying over the park, almost always in flocks. Recorded on 11 dates ( 2 in spring and 9 in autumn/winter). 37, 26th February [DT] - 17, 13th March [PR/DT]. 26, 16th September [PR] - 85, 13th October [PR] - 45, 29th October [SC/DT] - 104, 30th October [SC/PR/DT] - 72, 4th November [PR] - 76, 5th November [BL/PR/DT] - 21, 6th November [PR/DT] - 47, 9th November [PR] - 29, 2nd December [PR]. 5 flying south on 14th October [PR]. 1 flying north on 19th March [DT]. 1, 9th April [DT] - 1, 15th April [DT]. The bird observed on 15th April circled at great height over and around the site in the early morning, eventually descending to land momentarily at the edge of the Mare Perchée. Observed regularly flying over the park in small numbers (generally 1-15) in winter, early spring and autumn. Rather uncommon and irregular from April to mid-September. Much greater numbers observed occasionally in winter : for example 214 moving north in the space of 1 hour in the early morning of 25th February [DT] ; 80+ flying south during the afternoon of 10th December [SC/PR/DT]. An individual noted on site in winter (January and December), sometimes landing in the Northern Fields and/or the re-cycling plant. Uncommon – single birds observed flying over the park on 7 dates. 1, 2nd January [PR] - 1, 20th January [PR] - 1, 18th September [QD/PR/DT] - 1, 17th October [PR] - 1, 9th November [PR] - 1, 13th November [PR] - 1, 17th November [PR]. Regularly observed flying overhead in small numbers (usually 1-2) in winter, spring and autumn. Almost absent between mid-May and the end of October. Greater numbers sometimes noted in winter (for example, 27 on January 2nd [PR]). Less common than the preceding species, although observed more often this year than last (noted on 14 dates). Recorded mainly in spring (especially May) and in autumn (especially October). 1, 13th February [PR] - 2, 6th April [QD/DT] - 2, 1st May [SC/QD/FP/LS/DT] - 1, 12th May [DT] - 8, 24th May [DT] - 12, 25th May [DT] - 2, 26th May [QD/DT] - 1, 18th September [QD/PR/DT] - 6, 15th October [SC/QD/DT] - 7, 16th October [PR/DT] - 2, 17th October [PR] - 1, 20th October [PR] - 1, 13th November [PR] - 3, 19th November [PR]. Fairly common – small numbers noted regularly in winter, spring and autumn. Observed most often in March (6 dates). Apparently not recorded in June-July. [Unidentified gulls] (Goéland indéterminé) Larus sp. Unidentified gulls often noted in small numbers throughout the year. Sometimes greater numbers noted, particularly in early March this year (for example : 36 on 4th March [DT]). 1 (exceptionally late) observation in autumn. 1 flying south on 7th October [PR]. Breeding in the immediate vicinity, a fairly common resident and, with effort, seen almost daily throughout the year flying over the park in small numbers (usually 1-2). Up to 6 individuals noted fairly often on a building to the northeast (and outside) of the park where breeding is suspected. Migration patterns difficult to assess with certainty, birds probably moving ‘locally’ in the same manner as Wood Pigeons Columba palumbus. Small groups noted flying west during the early morning of 22nd April [DT]. However at this period small/medium sized flocks noted in the afternoons moving in the opposite direction (for example : 18 on 20th March, 38 on 17th April [SC/PR/DT]). Very rarely observed landing on site, it is noteworthy that a pair were attracted to the Mare Perchée during the early morning of 6th May, landing on nearby trees and at the water’s edge [DT]. Common resident, breeding on site – seen daily. Relatively small numbers on site boosted by local movements - small flocks or singles flying overhead in diverse directions. At the end of the breeding season (from the end of June) groups composed of adults and juveniles regularly noted feeding on the Northern Fields, particularly early morning. Active migration noted occasionally at the end of autumn when larger and more compacted flocks may be seen moving in unison high across the sky (for example : 246 flying south early in the morning of 31st October [DT]). Fairly common resident – 1 or 2 birds seen almost daily either in flight or perched near the Mare Perchée or at the re-cycling plant. Uncommon migrant. A good year and a welcome return after a 3-year absence. 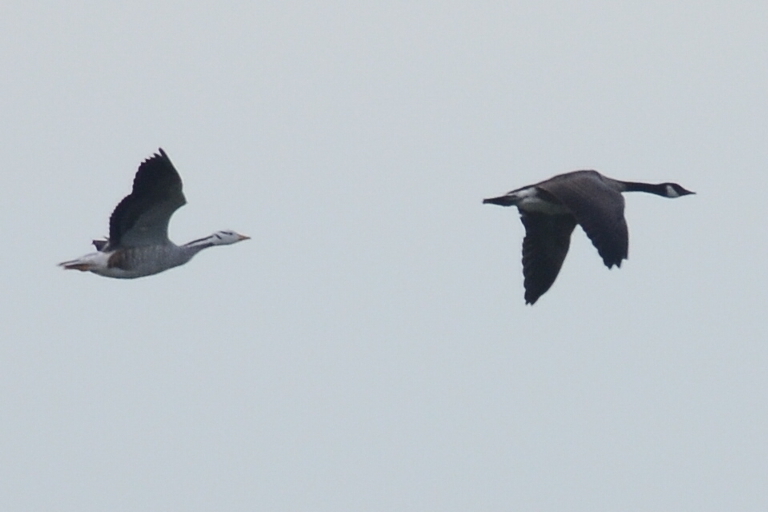 Recorded flying over the park in active migration on 6 occasions (3 in spring and 3 in autumn). Interestingly the spring birds all flew north in identical fashion at about the same time of day (between 08h00-08h30). 1, 2nd May [DT] - 1, 9th May [DT] - 1, 16th May [DT]. 1, 2nd October [PD] - 2, 3rd October [PR] - 1, 7th October [PR]. Very uncommon migrant. Another good year with 4 records; 3 in spring and 1 in autumn (as was the case in 2010). 1 (singing), 16th April [DT] - 1, 28th April [PR] - 1, 12th May [DT]. A poor year in comparison with 2010 – just 2 records. 1, 31st October [PR] - 1 (heard singing), 25th November [RP]. 1 observation at the beginning of the year. The bird was noted flying relatively low to the west, harried constantly by 3 Carrion Crows (Corvus corone). A common summer visitor – seen daily. First recorded in spring on 10th April [SC/DT]. Last observation in autumn on 5th September [DT]. Although several birds (presumably in active migration) were noted in mid-April the local populations were ‘in place’ on the 29th April [DT] (as was the case last year). Many more birds noted during May in comparison to 2010 (roughly 150 birds seen daily). Numbers bolstered considerably from the end of June, no doubt by the appearance of juveniles – up to about 300 (11th July) noted daily. Local populations apparently left the area at the beginning of August. Small groups of migrants noted flying south on 7th August [DT]. Very seldomly observed after the third week in August. The last record was of a lonely-looking bird flying south in the early morning of 5th September [DT]. A relatively common non-breeding resident. Observations usually consist of individuals or small groups flying noisily over the park, most often in a northeasterly direction. Almost absent at the beginning of the year (January-March) – noted for the first time (2 birds) on 14th March [DT]. 1-4 birds observed on 12 dates between 1st April – 31st July. Much higher numbers noted at the end of September (for example : 31 on 23rd , and 35 on the 30th [PR]). Birds were observed landing on site on several occasions either at the Cascade or the re-cycling plant – this behaviour is becoming less rare. At least one pair breeding in or very close to the park – seen or heard almost daily throughout the year. At least 1 juvenile noted regularly at the end of summer and in autumn (seen for the first time on 24th July [DT]). At least one pair breeding in or around the park – seen or heard almost daily throughout the year. A discreet resident – presumed breeding. Noted rather more often than in previous years (1-2 birds observed irregularly throughout the year). Seen flying over the park. Fairly common migrant in spring and autumn. Less frequently observed in spring than in autumn. Heard on migration for the first time on 9th February [DT]. Observed thereafter on 8 occasions until 6th April. Recorded for the first time in autumn (4 birds) on 2nd October [PD]. Noted thereafter on 13 dates up to and including the 6th November, with a maximum of 98 on 23rd October [SC/PR/LS/DT]. Exceptionally A. arvensis was noted in winter : 3 on 2nd January [PR] and 3 on 9th January [DT]. 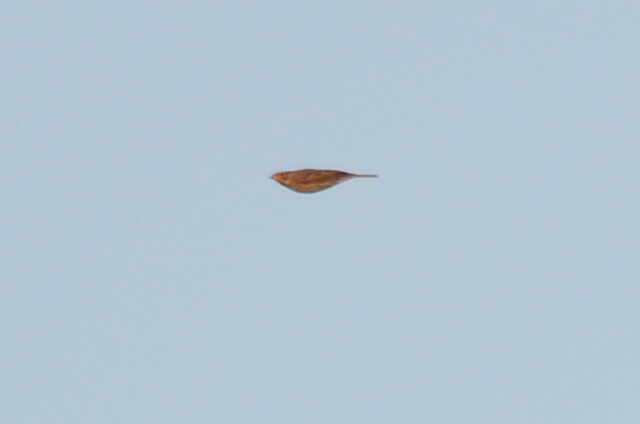 Uncommon but regular migrant - seen flying over the park. Noted only in autumn with small groups observed on 4 dates between the 13th October and 5th November. Rather uncommon migrant in spring and autumn – small numbers (generally 1-2) occasionally noted flying over the park. Observed on 14 dates (4 in spring and 10 in autumn). First spring record on 2nd April [PR/DT]. Noted thereafter on 3 dates up to 3rd June. Observed more frequently in autumn than in 2010. Recorded for the first time on 4th August (3 migrating to the southwest in the early morning [DT]). Noted thereafter on 9 dates up to and including 25th September [PR/DT]. Common passage migrant in spring and autumn. Very rarely observed in summer (June-July). First recorded in spring on 24th March [DT]. Spring migrants noted in small numbers almost daily up to 27th May with a peak of 52 on 25th April [SC/PR/DT]. Autumn migrants noted regularly from 4th August – 30th October with a maximum of 331 on 25th September [PR/DT]. The last observation of the year was of a particularly late bird flying north during the afternoon of 17th November [PR]. Passage migrant in spring and autumn. Small numbers noted irregularly throughout the summer. Greater numbers recorded than in 2010. First recorded on 10th April [SC/DT]. Last sighting on 14 November [PR]. In spring 1-8 birds noted fairly often up to 18th May. 1-5 ‘local’ birds noted occasionally during June – July. Greater numbers noted in August- early September when roughly 15 birds could be seen almost daily flying around the buildings to the northeast of (and outside) the park. Low numbers reported during autumn migration (roughly 20th August – 24th September) with a maximum of 71 moving south on 7th September [PR]. Noted on only 3 occasions between 24th September and 14th November. First recorded in spring on 5th March [PR/DT]. Noted regularly thereafter until 29th April. A notable peak was evident on 12th April when several birds were found on site at dawn, and a minimum of 89 flew northeast during the hour that followed [DT]. Absent during the summer (30th April – 23rd September). First reported in autumn on 24th September [DT]. Small numbers almost daily throughout the autumn with a rather feeble peak of 26 on 7th October [PR]. Last autumn sighting on 6th November [PR/DT]. First recorded in spring on 2nd April [LS/PR]. 1-7 birds seen fairly regularly up to and including 5th May. Exceptionally a bird was found singing briefly on site in the early morning of 9th April [DT]. First reported in autumn on 18th August [DT] – small numbers seen thereafter (1-10 birds) up to and including 1st October. Uncommon migrant (probably overlooked). 1 observation in autumn. First reported in spring on 28th February [DT]. Small numbers noted thereafter on 17 dates up to and including 16th April, with a maximum of 35 on 15th March [DT]. 1-2 birds noted flying south at the end of July (the 24th and 30th) [DT]. Small numbers reported on 13 dates in autumn between 20th September – 4th November, with a maximum daily total of 26 on 22nd October [LS/DT]. A relatively common passage migrant noted in spring and autumn. First reported in spring on 2nd April [LS/PR]. 1-3 birds noted on 9 further dates up to and including 10th May. First reported in autumn on 16th August [SO/DT]. Up to 17 birds noted on 18 further dates up to and including 14th September. As was the case in 2008 and 2009 mainly observed during the second half of the year. Singles noted on 5 dates between 2nd January – 23rd March. Not recorded between 24th March - 27th August. Small numbers (usually 1) noted during the last 4 months of the year. Birds apparently in active migration noted between 8th September – 16th October. Rare migrant. 1 observation (a female) in spring. Common breeding resident – seen almost daily. As in previous years several birds singing in the latter part of February and March when easy to find (far more discreet in summer). Like the preceding species discreet during the breeding season. A juvenile noted on 23rd May [DT]. Daily totals increased in spring and autumn by migrants (for example: 7 on 26th March and 2nd September). An exceptional year with 4 birds singing on site in spring. Breeding confirmed for the first time. 1-3 breeding pairs estimated. 1 heard singing along the Sentier des Vergers on 8th April [DT]. 1-4 individuals then either heard or seen almost daily up to and including the 2nd June. A juvenile observed at the Compost on 4th July [DT]. In early autumn 2 birds heard (calls) close to the Mare Perchée on 19th August. 1-3 birds noted regularly thereafter up to 13th September. Rather irregular and uncommon migrant. Absent during the summer (although breeding in the immediate vicinity of the park). 1-5 birds noted on 20 dates (4 in spring and 16 in autumn). Noted regularly in autumn on buildings to the northeast of (and outside) the park. 2, 24th March [PR] - 3, 25th March [PR] - 1, 26th March [DT] - 1, 23rd April [OL]. 4+, 9th September [PR/DT] - 3, 16th September [PR] - 5, 20th September [PR] - 2+, 22nd September [DT] - 4+, 24th September [PR/DT] - 1, 25th September [PR] - 3, 28th September [PR] - 4, 29th September [PR] - 1, 30th September [PR] - 1, 1st October [PR] - 2, 2nd October [DT] - 2, 3rd October [PR] - 1, 15th October [QD/PR/DT] - 1, 31st October [DT] - 1, 5th November [PR/DT] - 1, 13th November [PR]. Uncommon migrant. Observed on 8 dates (1 in spring and 7 in autumn). 1, 20th August [DT] - 1, 21st August [PD] - 1, 25th August [DT] - 1, 27th August [DT] - 2, 24th September [LS/DT] - 2, 28th September [PR] - 2, 1st October. Uncommon passage migrant. Observed on 4 dates (1 in spring and 3 in autumn). 1, 21st August [PR/DT] - 1, 24th September [PR/DT] - 1, 25th September [PR/DT]. Uncommon passage migrant. 1 observation (a male) in spring. An uncommon but regular passage migrant. 1-5 birds noted on 6 dates (4 in spring and 2 in autumn). 2, 2nd April [LS/PR/DT] - 5, 14th April [DT] - 2, 15th April [DT] - 1, 17th April [PR/DT]. 1, 17th October [PR] - 1, 4th November [PR]. Common resident – small numbers (usually 1-5 birds) seen daily. 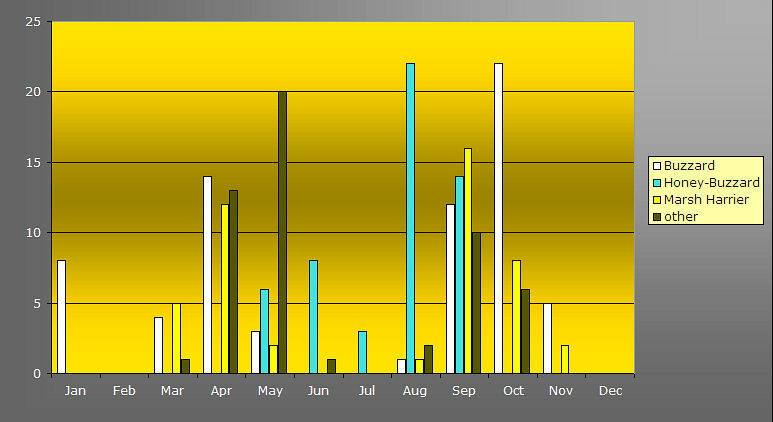 Higher daily totals at the end of autumn and winter (for example : 28+ on 27th November [PR]). Uncommon migrant in spring, late autumn and winter. Noted in small numbers, almost exclusively in migratory flight over the park, on 8 dates at the start of the year. Surprisingly just 1 record in autumn. 1, 2nd January [PR] - 2, 29th January [DT] - 1, 1st February [PR] - 1, 8th March [DT] - 3, 12th March [SC/PR/LS/DT] - 13, 26th March [PR/LS/DT] - 2, 30th March [DT] - 1, 14th April [DT]. Common breeding resident with 1-5 birds seen on most days – passage migrants increase the numbers observed in spring and autumn. At least 3 breeding pairs estimated. In spring up to 111 birds (2nd April [PR]) noted on site and/or in migratory flight north/northeast (late March and early April). Rather more discreet in summer (late June – mid September). Numbers bolstered by migrants in autumn (from the 24th September [DT]). Migration apparent up to 6th November (generally fewer birds noted in comparison with previous years). Very few records in November-December (1-2 individuals). Reasonably common passage migrant in spring and late autumn – small numbers observed irregularly in winter. Fewer birds noted in winter compared to 2010: roughly 1-10 birds observed on site at the beginning of the year, and only noted twice at the end of the year (late November-December). Spring migration evident from 26th February-6th April, with a maximum of 41 on 11th March [DT]. An individual noted on site on 15th April [DT]. First observed in autumn (44 birds) on 8th October [QD/DT] – the same date as in 2010. Migrants observed up to 6th November, with a maximum of 110 on 29th October [DT]. Reasonably common resident with 1-3 birds seen almost daily in early spring, autumn and (especially) winter. Estimated 1-2 breeding pairs either in or very close to the park. Very discreet in late spring and summer (almost absent from late March to mid-September). Observed occasionally in active migration (fewer observations compared to 2010) : in spring 1-7 birds noted twice in mid-March (the 14th and 23rd), and in autumn (from 30th September to 5th November) 1-3 birds observed flyting south on 4 dates. Rare migrant. An exceptional year with 2-5 birds observed on 9 dates (in April, May, July and September). Breeding possible but not confirmed. 1 (probably 2) individuals present in the Savanna for 6 consecutive days in spring. 1, 5th April [PR/DT] - 1-2, 30th April and 1st-5th May [SC/QD/CF/PR/LS/DT]. 1 (singing), July 23rd [DT]. A disappointing year. Usually seen and heard daily in spring and summer, this species was far more discreet in 2011. 1-2 birds noted irregularly in spring at the Mare Perchée (although observed just as often away from it). Breeding possible but (for the first time in several years) not confirmed. Recorded for the first time in spring on 23rd April [OL]. Last observation in autumn on 3rd September [DT]. The bird sang throughout the morning from the Coffee Dome (Butte Sud). Fairly common summer visitor. Fewer birds than in 2010. 1-2 breeding pairs estimated. First recorded in spring on 13th April [YC]. Discreet in summer and seldomly seen (apparently just one observation during August). Noted for the last time on 5th September [DT]. Common summer visitor and passage migrant – seen or heard daily from 26th March – 2nd October. Unlike in previous years not observed in late autumn (no records between 2nd October – 10th December). Juveniles noted for the first time on 23rd May [DT]. As usual, numbers increased in autumn (between 25th August – 24th September), with a maximum of c30 on site on 27th August [DT]. Present on site in winter at the end of the year – at least 2 individuals noted twice in December [PR/DT]. A disappointing year for this attractive species which is usually present on site throughout the spring and summer (and bred successfully in 2009). Just 2 records - (1 in spring and 1 in autumn). A common summer visitor, seen or heard daily. 4-5 breeding pairs estimated. First reported in spring on 2nd April [LS/PR/DT]. Last noted in autumn on 17th September [DT]. Fairly common summer visitor – 1-2 breeding pairs estimated. First reported in spring on 27th April [OL]. Settled on site by the 10th May [PR/DT]. Thereafter heard or seen almost daily until 11th July. It’s apparent absence in late summer is typical of this species – observed for the last time on 17th August [DT]. A rather uncommon non-breeding species, noted in spring, summer and autumn. First recorded in spring on 25th March [DT]. Thereafter 1-2 birds observed on 8 dates up until 4th May. 2 birds noted (1 singing) on 27th July [DT]. In autumn 1-2 birds noted on 11 dates from 18th August to 17th September. 1 record (exceptionally early) in spring. First reported in spring on 26th February [DT], and first heard singing on 12th March. Up to 8 birds seen daily thereafter throughout the summer. Juveniles noted on 28th May [DT]. Unlike in previous years, no noticeable increase in numbers in late autumn (generally 1-6 birds noted daily throughout August, September and October). An individual with an unusual call was present around the Mare Perchee from 5th-14th September – a sound recording may be consulted on the website. Lower numbers in November (1-2 birds noted in the middle of the month [PR]). 1-2 birds present on site in December [PR/DT]. Small numbers (1-5 birds) noted in winter at the start and end of the year – apparently not recorded between April and September. 1-3 birds present in winter at the beginning and end of the year. A singing male observed on 31st March and 1st April [DT]. Not recorded between 6th April – 24th September. Uncommon passage migrant in spring and autumn. Observed on 7 dates (1 in spring and 6 in autumn). 1, 20th August [PR/DT] - 2, 27th August [DT] - 1, 28th August [DT] - 3, 3rd September [DT] - 2, 9th September [DT] - 1, 10th September [DT]. Passage migrant recorded on 11 dates (1 in spring and 10 in autumn). 1, 20th August [DT] - 1, 23rd August [PM] - 2, 27th August [DT] - 1, 28th August [DT] - 2, 2nd September [DT] - 4, 3rd September [DT] - 3, 9th September [PR/DT] - 1, 21st September [OL] - 1, 22nd September [PR] - 1, 1st October [DT]. Scarce winter visitor and passage migrant. Observed on 2 dates (1 in spring and 1 in autumn). Common breeding resident. 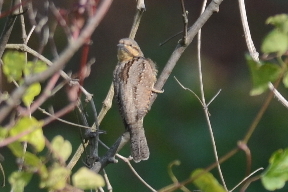 Slightly less numerous than P.major – usually 1-4 birds seen daily. Very uncommon. 2 records (1 in winter and 1 in spring). 1, 2nd January [PR] - 2+ (adult and juvenile), 29th May [LS]. Fairly common resident – 1 or 2 breeding pairs estimated. Up to 10 birds seen irregularly throughout the year. A pair observed constructing a nest from 23rd-25th February [DT]. In the Savanna observed carrying food on 26th April [DT]. Juveniles observed on 16th May [DT]. True to form, A.caudatus was either absent or very discreet for a period in summer (apparently not recorded in July and the first half of August). Inexplicably scarce at Beaumonts – just 2 records. 1, 21st January [PR] - 1, 9th September [PR/DT]. Reasonably common resident (at least 2 breeding pairs estimated). Small numbers (1-3 birds) either seen or heard regularly throughout the year. More discreet in spring and summer (from mid-March to mid-August). Very common breeding resident, seen daily. Fairly common breeding resident. Usually 1-3 birds seen daily. Unlike previous years, no active migration noted in 2011. Uncommon. Observed on 7 dates (5 in spring and 2 in autumn). 1, 25th February [PR] - 27, 26th February [DT] - 3, 28th February [DT] - 3, 15th March [DT] - 1, 27th March [DT]. c30, 30th October [DT] - 33, 5th November [BL/PR/DT]. A rather uncommon migrant. Records typically involve small, loose groups of less than 10 birds flying purposefully overhead. This was a particularly good year: observed on 30 dates (twice as many as in 2010). Noted in every month of the year except June and December. Observed in small numbers in spring: 1-3 birds noted on 11 dates between 26th February – 28th May. 2 flying south on 11th July [DT]. In autumn up to 33 birds observed on 17 dates between 27th August and 13th November. There was a notable peak over the weekend of 22nd-23rd October when 54 birds flew southwest overhead. Common breeding resident - usually up to 10 birds seen daily. Larger numbers sometimes noted, such as on 27th August when at least 20 swarmed together over the Bois de Bordure to dislodge an unwanted Honey-buzzard (Pernis apivorus) from the area [DT]. Juveniles noted for the first time on 23rd May [DT]. The presence of juveniles at the end of summer and migrants in late autumn increases numbers significantly. Migration apparent in autumn between 20th August – 6th November. During this period large flocks sometimes noted flying over the park (for example, c400 on the 29th October including one group of 180 [DT]). Migration also noted in spring between 10th-30th March, with a peak of 60 on 16th March [DT]. Unusually there were some large movements observed in winter, especially on 2nd January when c600 were seen flying southwards [PR]. An exciting observation a bird singing from the tops of the trees around the Parc Mabille in the early morning, between 07h15-07h45. Fairly common resident, breeding on the outskirts of the park. Usually 1-4 birds seen daily. Unusually a large flock of about 50 birds was present in the northern section of the park for 2-3 weeks at the end of July and the beginning of August. P.montanus has unfortunately become quite a rarity; the species has suffered a marked decline in the region. Fairly common in winter with small numbers seen daily. Discreet and rarely reported during the summer (noted on only 4 dates in July-August). Common passage migrant in early spring with small numbers noted flying northeast from 25th February to 4th April, with a maximum of 231 on 16th March [DT]. Migration noted in late autumn with birds flying west and southwest between 20th September and 10th November with a maximum of 125 on 29th October [SC/DT]. Regular but rather uncommon passage migrant and winter visitor. Present on site at the beginning of the year (1-14 birds noted daily in January). Migration noted in spring and autumn. Unlike last year, not present on site in December. Spring migration noted between 22nd February and 4th April, with a maximum of 78 on 23rd March [QD/DT]. In autumn observed for the first time on 7th October [PR]. Noted quite regularly thereafter until 5th November with a maximum of 23 on 27th October [PR]. Reasonably common passage migrant noted in spring and autumn. First reported in spring on 26th February [DT]. Noted thereafter on 20 dates up to and including 21st May with a maximum of 14 on 2nd April [PR/LS/DT]. Observed for the first time in autumn on 21st August [PR]. Noted thereafter on 13 dates up to and including 19th November with a maximum of 15 on 1st October [DT]. Very uncommon winter visitor and passage migrant. Recorded flying over the park on 7 dates (4 in spring and 3 in autumn). 1, 24th March [DT] - 1, 25th March [PR] - 1, 2nd April [LS/PR/DT] - 1, 5th April [DT]. 1, 7th October [PR] - 1, 20th October [PR] - 1, 6th November [DT]. A group of 10-15 birds present on site in winter at the beginning and end of the year (January and December). Rarely reported in summer (late June – September). Active migration noted occasionally in spring and autumn: in spring observed on 10 dates between 2nd March-12th April with a maximum of 11 on 26th March. In autumn noted on 12 dates between 14th September-5th November with a maximum of 27 on 16th October [PR/DT]. A group of roughly 16 birds was present on site in winter (January-March and November-December). Rather uncommon winter visitor and passage migrant. A better year than last - observed in small numbers regularly at the beginning of the year until late March. Visible migration in spring noted between 22nd February and 30th March with a maximum of 20 on 27th March [DT]. Observed on 10 dates in autumn from 7th October to 21st November with a maximum of 48 on 13th October [DT]. Fairly common resident with 1-2 breeding pairs estimated in or very near the park. Small numbers (usually 1-2 birds) seen irregularly from early March. Very rarely recorded in summer. Irregular presence in winter – very few records in January-February. 2 birds present in the Savanna in late December [DT]. Heard singing for the first time on 22nd February [DT]. Noted occasionally in active migration (for example, 5 on 13th Octobre [PR]). A discreet but reasonably common resident, although in very low numbers. 1-4 birds seen fairly regularly throughout the year. 1 pair bred successfully, raising at least 2 young. A pair observed carrying nest material on 9th April [DT]. 2 juveniles observed at the Compost on 1st August [DT]. Uncommon winter visitor and passage migrant in spring and autumn. Observed often during the first half of the year – almost absent during the second half. A group of up to 7 birds present on site between 1st January and the end of March (observed daily). Active migration in spring noted on 8 dates from 28th February to 2nd April with a maximum of 7 on 23rd March. 3 records in late spring: 2, 21st may [DT] - 1, 26th May [DT] - 1, 5th June [PR/DT]. Inexplicably absent at the end of the year. Just 2 records in autumn: 1, 13th October [PR] - 1, 31st October [DT]. Fairly common in spring and autumn. Unlike previous years not recorded in winter at the start and end of the year (not recorded before 9th March and after 9th November). 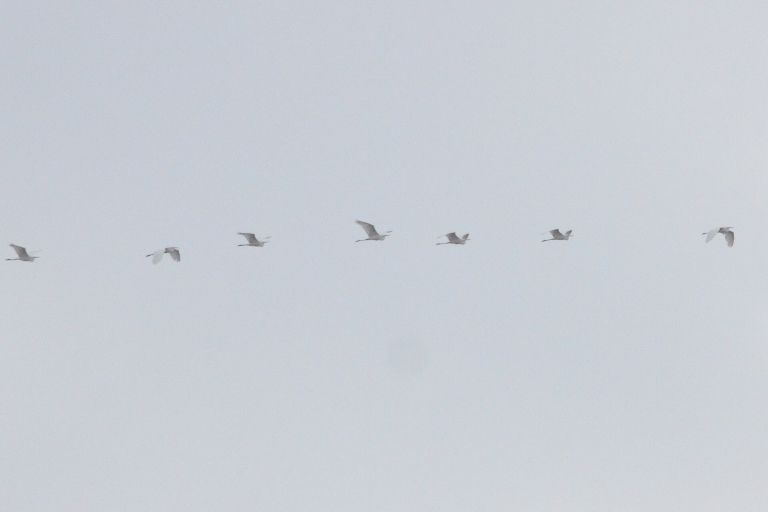 1-5 birds noted in active migration in spring (on 6 dates between 9th – 26th March). As was the case in 2010, absent at the end of spring and in summer – not recorded between 6th April and 7th October. In autumn noted for the first time on 7th October [PR]. 1-5 birds observed on a further 7 dates up to and including 9th November (the last sighting of the year [PR]). Rare migrant. 1 observation of a bird migrating south in autumn. Uncommon migrant. Another good year – recorded flying over the park on 4 occasions (1 in spring and 3 in autumn). 1, 22nd October [LS] - 3, 29th October [DT] - 1, 4th November [DT].